Cucumber is an excellent source of silica, which is a trace mineral that contributes to the strength of our connective tissue. Connective tissue is what holds our body together. Cucumbers are effective when used for various skin problems, including swelling under the eyes and sunburn. They also contain ascorbic and caffeic acids. These acids prevent water retention. That may explain why when cucumbers are applied topically they are often helpful for swollen eyes, burns, and dermatitis. 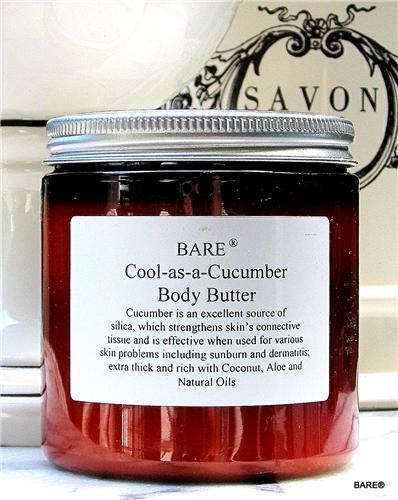 BARE Cucumber Body Butter is extra thick and rich with Coconut, Aloe and Natural Oils; a silky-smooth, paraben-free butter that quickly melts into skin to restore softness and hydration. High in glycerin, this body butter is long lasting and absorbed quickly.